There's a new symbol. Yellow-painted hands with four fingers extended in an upward position. That symbol even found its way to Parliament Hill a few days back, in Ottawa, Canada, when Brotherhood-supporting Egyptian-Canadians rallied, holding posters of deposed Mohammad Morsi, demanding his return to government and the reinstatement of the Muslim Brotherhood. Among the hundred or so protesters assembled there were upraised hands, four fingers high. Post-Friday prayers as the faithful followers of the Brotherhood streamed out onto the streets of Cairo and other Egyptian cities found similar scenes where yellow posters appeared everywhere. They are printed surreptitiously in small shops specializing in the production of Islamic documents, and the Koran. Little Islamic bookshops no one might suspect, and then the posters were distributed quietly by dedicated youth. Tens of thousands of Brotherhood supporters rallied. Government agents weren't certain where they would gather; this time around, messages of times and places were silently conveyed. In one area where Egyptian intelligence were prepared, erecting barbed wire, furnishing the area with police and security and the presence of army tanks, it became clear they had been tricked, and no protesters appeared there. Small, discreet groups of as few as three meet in private nightly to debate the form of the protest to be taken, relating to the security situation as it pertains day by day. When they disperse they go to various mosques to relay the decision made to others, through coded telephone calls and text messages, effectively bypassing Egyptian intelligence. Top Brotherhood leaders, though imprisoned are finding ways to communicate. A rumour was being circulated that the Muslim Brotherhood's Supreme Guide, Mohamed Badie has died in prison. The Interior Ministry affirmed in a Saturday statement that he had suffered a heart attack in Tora prison, held there awaiting trial. That he died was firmly denied. His condition is said to be stable, with a team of doctors examining him. Egyptian security officials have turned for assistance to police officers now retired, whose background in tracking Islamist groups would be invaluable now, in attempting to monitor the Brotherhood activities. With their help former lawmaker Mohammed el-Beltagy, a senior Brotherhood operator had been monitored for several days, evading capture, before he was finally arrested on Thursday. The protests, not as large in their turnout as previously, although managing to assemble roughly ten thousand in Cairo, were largely peaceful, though some sporadic violence did occur. Security forces fired tear gas at some marches. Angry residents confronted Brotherhood supporters again as they have done previously, threatening violence at the disruptions they were mounting. Six people were confirmed to have been killed nationwide. A policeman was also killed. Protesters succeeded in what they had set out to do, marching through the streets chanting slogans condemning army chief Gen. Abdel-Fatah el-Sissi. "The people want the death of the assassin! ", Waving the Egyptian flag and holding aloft yellow posters with the outline of a four-finger-up hand, they chanted their defiance. Egyptians, much like their counterparts elsewhere in the Arab Middle East, are big on demanding death. Their new symbol is seen everywhere now; online, in street campaigns, to recall the sit-in protest around the Rabaaah al-Adawiya mosque, which translates to Fourth, in Arabic. "When it started, it was only about the return of Morsi to power. Now it has gone past that. Blood has been shed. ", explained Ahmed Osama. Again, a not-unusual event in the geography. The conundrum that is represented by intervention in the affairs of the Middle East seems a puzzle not amenable to reasonable debate, to theory and proposed results, to any manner of logical explication or expectation. Always anticipate the unexpected. And now, added to that can be the caution that if any country outside of the Middle East plans to be slightly involved they should also anticipate full embroilment in a manner they could not conceivably imagine beforehand. The U.S. knows full well what happens when it ventures into the geography where tribalism, warring factions, vicious sectarian hatreds and political-geographic spoils along with the byzantine jockeying of tyrants, dictators, autocrats and their totalitarian coalitions result in. There is a unifying body that meets on occasion to discuss matters of geographic moment and they call themselves the Arab League. All problems relating to Arab-Muslim events to be debated within. Consensus sought and occasionally found, but not necessarily. Consensus is usually arrived at with little need for extraneous debate with respect to the irritating presence within a Muslim-majority geography of a Jewish state. Not so much with the issue of conflict within a state itself when a minority-led government violates the most basic human rights of its majority-population civilians, as in Syria at the present time. But even there, with a general agreement that the slaughter of civilians by the Alawite Baathist government of President Bashar al-Assad targeting the Sunni rebels and the "terrorist" Sunni jihadis that have come fully equipped with hatred and slaughter of Shias in mind, uncertainty takes the day. Saudi Arabia, Qatar, the oil-wealthy Gulf States who traditionally have spent their riches in wild excess have always complacently felt that the West should offer financial assistance to their poor brethren. And so it is with conflict that regularly roils the region. It was not Egypt, Saudi Arabia, Syria and Qatar who collectively assembled their well-armed militaries to persuade Saddam Hussein that it would be in Iraq's best interests, after all, to evacuate their presence from tiny oil-rich Kuwait, but the United States, whom they joined in the enterprise. The later ill-fated and poorly-decided American second invasion of Iraq mired the United States and its allies in a timeless, divisive, costly and bloody unending war. The initial invasion of Afghanistan and the routing of al-Qaeda to free that country from its Taliban oppressors similarly left another coalition of the willing, NATO and UN troops futilely battling a resurgent insurgency inflamed with religious virtue and death-mongering, determined to retake what they had conquered, to further abase and violate the human rights of a people that had long since grown accustomed to living a medieval lifestyle in a 21st-Century world. And now, here once again, is the United States, the world's arbitrator, faced with yet another one of those spontaneously bitter slaughters where a feeble protest gave birth to a civil war, and another Arab Muslim government saw fit to unleash hell on its people. The wealth of the Arab League rendered a paltry aid to the disorganized, tribally-agonized rebels who gained by the entry of jihadists, realizing too late that their Syria would no longer be theirs if the jihadists prevailed. The hatred emanating from the Arab world toward the United States is endemic and pervasively reliable. It undergoes rebirth each time Middle East powers plead for intervention to halt one of their own in destroying one of their own. "First of all a punitive strike against the regime. Then political and military support for the Free Syrian Army. For the Assad regime enjoys total support from Russia, Hezbollah and Iran. We lack everything. Our allies have given us nothing of what we want", urged Ahmad al0-Jarba, of the Syrian opposition coalition. In Tehran, Syria's sponsor, the Islamic Republic of Iran, sneers at the incompetence and incoherence of the West, and in particular the fumbling past interventions of the United States with its hyperbolic assurances that precedence and danger requires its response. General Mohammad Ali Jafari, commander of the Revolutionary Guard Corps claims an attack on Syria "will mean the imminent destruction of Israel. Syria will become the second Vietnam for the United States." And in London, Jihad Allaham, speaker of the Syrian People's Assembly, implored British lawmakers to oppose the use of force: "We ask you to stop the rush to reckless action", for a military strike would breach international law. And it is most encouraging to know that the Syrian regime is so concerned with the breaching of international law; that being so, presents as proof positive it would never, ever have used chemical agents against its people. Persuasive enough to ensure that Prime Minister Cameron did not get the green light he sought to militarily accompany the United States in punishing Syria, leaving the field open to France to stand by. "We have concluded that the Syrian government in fact carried these out. And if that's so, then there need to be international consequences", asserted American President Barack Obama. And so the world waits for a reprise of Levantine history of the modern age. President Barack Obama confirmed Friday night that the forthcoming US military attack on Syria would be “limited” and “narrow” and not open-ended, in a bid to avoid the risk of America being mired in the Syrian civil war. DEBKA Weekly’s analysts calculated Thursday that by forgoing an air assault and relegating his projected military operation against Syria solely to seaborne Tomahawk cruise missiles - limited to 15 launches - the US president relinquished America’s “penetration and destruction” capabilities – depending of course on his sticking to this plan and not expanding its scope at the last minute. The Tomahawk cruise missile has a range of 2,500 kms, weighs 450 kilos and can be fired from the five US destroyers and the four US nuclear submarines waiting in the eastern Mediterranean for orders to go. 1. Syria’s chemical weapons stockpiles will remain intact. The Tomahawks can damage surface structures at the bases hosting them, but not penetrate their underground storage sites. Assad will be left in full possession of his CW arsenal. 2. Neither can Tomahawks alone cripple the Syrian Air Force or shut down its bases. They could damage runways, but only for the hours or days it would take to repair them. DEBKA Weekly's military sources say that the Syria air force is left with six air bases still operational, out of a total of thirty. A heavier and larger missile onslaught than the limited assault planned could have destroyed them all, given the Syrian rebels a huge advantage and opened the way for a plan to impose no-fly zones over Syrian air space. But Obama clearly chose to discard those options. By delaying his go-ahead on military action against Syria, he gave the Assad regime time to tuck most of its air force bombers and attack helicopters away in fortified hangars early this week, safe from attack. As the hours slipped by with US action, the Syrian ruler’s self-confidence mounted. 3. Syrian missiles have likewise been hidden in underground bunkers. They include the Scud C and D missiles capable of carrying chemical warheads. 4. The big Syrian field command centers will also escape unscathed, although DEBKA Weekly’s military sources report that many of them figure as large as strategic assets on the list of targets which the Pentagon and US military chiefs originally put before the president. Among them were the command and control centers of the Syrian army’s 4th Division and Republican Guard Division, which protect Bashar Assad and bolster his regime's hold on power. It is not clear if the military command centers of Homs, Hama, Tartus, Latakia, the Aleppo area and Idlib remain on the final list. Striking those targets would have shut down the Syrian military command system and seriously disrupted its operational capabilities. A second list of 35 strategic targets was handed to President Obama by Syrian rebel commander Brig. Gen. Salim Idris, according to our sources. Their destruction was described as vital. However, not a single item on the list was approved by the president, the Pentagon on the Chairman of the Joint Chiefs, Gen. Martin Dempsey, reflecting the distrust and disconnect prevailing between the US administration and military, and the Syrian rebel leadership. 5. Our sources say that the US military to-do list for Syria covers army artillery units, some of which participated in the chemical weapons launch of August 21 against eastern Damascus; local command and communications centers; and research institutes involved in the development and upgrade of Syrian chemical weapons. This heavily pruned US operation, if it goes through, will leave Syrian President Bashar Assad sitting pretty with most of his military resources intact, and his hands free to continue his barbaric war on the Syrian opposition, including the use of chemical weapons, unhindered and undeterred. It is still possible for President Obama to have second thoughts about his low-key operational plan and decide after all to land a strategic blow on Syria. Reeling from a fierce security crackdown, the Muslim Brotherhood brought out mostly scattered, small crowds Friday in its latest protests of Egypt’s military coup. While the remnants of the Brotherhood’s leadership are still able to exhibit strong coordination from underground, the arrests of thousands of its supporters and members - and the fear of more bloodshed - have weakened its ability to mobilize the streets. The day’s largest single Cairo demonstration was more than 10,000 people outside the presidential palace, with thousands also taking part in another similar-sized rally outside the capital. However, the majority of protests Friday were smaller than in the past, consisting of several hundred protesters or fewer around the country. It was an intentional shift in tactics from a week ago, when the group failed to rally in a single location as a show of strength. Security officials dubbed it the “butterfly plan” - a flurry of protests to distract them. Rather than have protests converge in one square and encounter force from police and angry residents, the group appeared to purposely plan hundreds of small marches as another way of continuing demonstrations and avoiding bloodshed, according to security officials who spoke on condition of anonymity because they were not authorized to speak to media. Protest organizers also tried a bit of subterfuge: They said a rally would take place in Sphinx Square in Cairo, but after security forces barricaded the site with barbed wire, tanks and roadblocks, only a few hundred people demonstrated nearby, and the biggest crowd converged across town at the presidential palace. Tens of thousands heeded the Brotherhood’s call nationwide for a day of “decisiveness,” in which the group urged people to “break your fear, break the coup.” They marched defiantly past tanks and armored vehicles on the streets of Cairo and other major cities. More than 1,300 people, most of them Brotherhood supporters, have been killed since President Mohammed Morsi, a longtime leader in the group, was ousted in a popularly backed coup July 3. Violence peaked two weeks ago when security forces attacked two Brotherhood-led sit-ins, killing more than 600 people in the assaults. More than 100 policemen and soldiers have been killed since the Aug. 14 raids. Police stations, government buildings and churches also have been attacked. The Brotherhood has more than 80 years of experience operating secretly as a banned organization. It was not until after the 2011 revolution that ousted President Hosni Mubarak that the group surfaced with its full might and created its own political party. The group appears to have changed its tactics from two weeks ago, when it urged people to converge in a main Cairo square. Nearly 100 people died in that incident, with protesters jumping to their deaths off an overpass as residents and police fired on them from different vantage points. They took cover in a nearby mosque, which the army besieged before arresting those inside. In another development, U.S. Ambassador Anne Patterson left Egypt after a little more than two years at the post, the State Department said. David Satterfield will be acting ambassador, taking a temporary leave from post as director-general of the Sinai peacekeeping force, it added. Patterson had come under criticism from both Mursi supporters and opponents, which each accused the U.S. of supporting the other side in the political divide. Cairo residents mostly stayed off the streets Friday in anticipation of the Brotherhood rallies. A military-imposed nighttime curfew in Cairo and 13 other provinces started two hours earlier. The location of the rally at the presidential palace was kept largely secret until the last hour, even from those leading the march. In expectation of possible protests converging there, security forces had blocked parts of the road in front of the presidential building, but had greater security around Sphinx Square. One of the protest leaders, Ahmed Khaled, said organizers didn’t tell demonstrators where the march was heading for security reasons. Khaled and others said they were receiving instructions by phone on where to direct their march as it was happening. He declined to elaborate. “We stopped communicating the itinerary and destination of the marches so nobody can follow us or wait for us with snipers at the arrival point,” he said. Thousands gathered in other cities, with smaller protests drawing hundreds and sometimes just dozens, including many women and children. They marched through neighborhoods that are largely sympathetic to them while others traveled outside their villages to areas where they are not known to avoid security forces and neighbors working with police in their hometowns. Brotherhood officials in the provinces communicated with people in Cairo who alerted them to the overall plans, according to security officials and members of the group. With little local media coverage of their protests, they also have activists stream live video of their rallies with cellphones. Videos are then disseminated on the group’s Facebook pages and sent by email to foreign media outlets. Notably absent were large numbers of supporters from the Brotherhood’s more hard-line allies in the Salafi parties, which have begun distancing themselves from the group. Those who did take to the streets chanted against the army chief, Gen. Abdel-Fattah el-Sissi, who led the coup. The yellow poster was in every protest Friday. According to members of the Brotherhood, who spoke on condition of anonymity because they feared reprisal, the posters are printed in secret locations, sometimes in the backs of Islamic bookstores and then distributed by youths in different towns. A group, sometimes as small as three people, meets in private at night to discuss the form of protest, depending on the security situation that day. They then disperse to different mosques and relay the word to others through coded phone calls and text messages. Imprisoned top leaders are also believed to be relaying messages through their lawyers to Brotherhood units that then pass the word on to other members. It is also common practice in Egypt for prisoners to bribe guards to use their phones. Security officials say they have turned to retired police officers who worked for years tracking Islamist groups to help monitor the Brotherhood. Security officials told The Associated Press they monitored former lawmaker Mohammed el-Beltagy for several days before arresting him Thursday. While largely peaceful, the protests saw some sporadic violence in Cairo and elsewhere as security forces fired tear gas at some marches and angry residents confronted Brotherhood supporters. The group said seven people were killed nationwide; a government health official said only six died. Also, a soldier was killed and three wounded at night when gunmen on a motorcycle opened fire at their post in the Suez Canal city of Port Said. Earlier, unidentified gunmen in two cars opened fire on a police station in Cairo, killing an officer and a civilian. The drive-by attack wounded another officer, according to the state-owned MENA news agency. “The terrorist groups and those breaking the law that want to tamper with the country’s security will be blocked,” the statement said, warning people to abide by the curfew. Not all of Friday’s protesters were from the Brotherhood. Some said they were seeking justice for relatives killed by security forces this month or protesting the way in which Mursi, Egypt’s first freely elected president, was removed from power. Tarek Safa, a 43-year-old engineer protesting with his teenage daughter in Cairo, said the Brotherhood may have lost its leadership but was not crushed. "Last Wednesday, in the hours after a horrific chemical attack east of Damascus, an official at the Syrian Ministry of Defense exchanged panicked phone calls with a leader of a chemical weapons unit, demanding answers for a nerve agent strike that killed more than 1,000 people. Those conversations were overheard by U.S. intelligence services, The Cable has learned. And that is the major reason why American officials now say they're certain that the attacks were the work of the Bashar al-Assad regime -- and why the U.S. military is likely to attack that regime in a matter of days. "But the intercept raises questions about culpability for the chemical massacre, even as it answers others: Was the attack on August 21 the work of a Syrian officer overstepping his bounds? Or was the strike explicitly directed by senior members of the Assad regime? 'It's unclear where control lies', one U.S. intelligence official told The Cable. 'Is there just some sort of general blessing to use these things? Or are there explicit orders for each attack?" Since the intercepted message is of prime interest and does most certainly point a finger of responsibility at the Assad regime, but it remains unclear how high up the ladder of command the communication went, with no clear delineation whether there were standing orders from on high, or individual initiative was taken because there was no need under a general order to ask permission, there is an atmosphere of uncertainty in the minds of intelligence officials. Yezid Sayigh of the Carnegie Middle East Centre claims it unlikely that commanders would be required to seek permission specifically for each attack they plan. Since he feels that President Assad would have established discreet and discrete use of chemical weapons as a broadly held policy. The green light is there, the decision when, where and how to use them at the discretion of each commander. Intelligence reports out of Israel inform through satellite images that the regime had been moving chemical weapons stocks into the area before the attack, as reported by the Wall Street Journale-placed. "What's driving the certainty is the intercept evidence, particularly of communications from Syrian defence officials to field units, in conjunction with prior evidence of stockpiles being moved into the area. But this is not just about the Ghouta incident, this is about the accumulated evidence of all those attacks going back to the spring", said Shashank Joshi with the Royal United Services Institute. There is wide incredulity that Bashar al-Assad would presume to provoke such a reaction from the international community by his imperturbable use of prohibited weapons of mass destruction. His calmly bland denials of responsibility for the attacks and the deaths of well over one thousand of his own citizens, pointing the finger of blame at the rebel "terrorists", despite the reality that none of the opposition has the means to mount attacks such as those, both infuriate and puzzle. On the other hand, proof-positive keeps popping up all over the place. It is not only the previous such attacks that took far fewer lives, but the regime's stark flippancy about it all, as though it is of little consequence, as though it all represents a dare, one he is convinced there will be no response to. It is as though a native sense of caution has slipped away, as though his masters in Iran have convinced him that there will be no consequences. As they wait with eager suspense to see whether there will be any, and if so, what, possibly? The virtual wrist-slap that seems likely, as a tch-tch warning that the civilized world will not stand idly by while a country ravages its own, and spreads the horror of civil break-down throughout the region? As a rehearsal for the Islamic Republic of Iran's own future plans? One can theorize till the cows come home to be milked. And that's what it is, credulity being milked. And, as additional provocation and flip of the wrist, the latest attack that took place at a high school when teens were finishing up school for the day and preparing to return home in the town of Urum al Kubra, close by Aleppo. Where a regime plane was seen circling above as though searching for a target, and children were told to quickly disperse. And where they were bombed as they attempted to escape. Those involved suffering from Napalm-appearing burns from an incendiary bomb. "Both the increasing frequency, and statistically the increasing deadliness of [their] co-ordinated nationwide bombings in Iraq underlines the extent of their operational reach and the huge depth of their resources." Iraq held a brief flirtation with social quiescence, a damping down of the ferociously toxic tribal and sectarian violence unleashed with the absence of the tyrannical fist of Saddam Hussein. Even the presence of a hundred thousand foreign troops stationed there to guide the country back to a semblance of order and good government was incapable of curtailing the madness of blood lust that overtook Shia and Sunni factions intent on destroying one another in 2006/07. But it did reach a crescendo of carnage and bloodletting. It merely represented sectarian distrust and fear one of the other translating into death, mutilation, horrors. And while it resulted in horrendous blights of human descent into madness, the results did not prove their permanence. The majority Iraqi Sunnis, witnessing the even greater ruthlessness and lack of humanity of the invading al-Qaeda jihadists experienced a revulsion greater than that they held for their Shia national counterparts. That relative social peace that resulted lasted just about as long as the tripartite governance put in place with the encouragement of the United States was able to function. Until the Shia Prime Minister Nouri Maliki issued a warrant after the departure of the Americans, for the arrest of the Sunni Vice-president under the country's antiterrorism laws. The Al-Iraqiya parliamentary bloc representing Iraq's Sunnis had already withdrawn from the coalition. Tariq al-Hashemi had issued his own accusations against Prime Minister Maliki, of abuse of power. He is now a wanted man, finding haven in Qatar. Now the majority Shia who were once repressed under the minority Sunni Baath party of Saddam Hussein who fought a long, destructive and bitter war with Iran, holds the reins of power. And has forged an amiable relationship with Iran. Placing Iraq alongside Syria, though not yet in the same league, within the Shia power bloc. And as in Syria, al-Qaeda's new affiliate, recently renamed the Islamic State in Iraq and Syria, is intent on slaughtering Shia Muslim 'heretics' and restoring the country to Sunni rule. The country has been wracked in the last several months with co-ordinated, well-orchestrated car bombings, al-Qaeda's specialty. The odds are looking fairly convincing that the country will be again gripped on bloody sectarian violence, as it experienced in 2006 and 2007. A traffic policeman thought a car looked suspicious, parked close by a parking lot and alerted everyone on the street: "Car bomb!" Pedestrians responded immediately in a huge panic, not knowing where to run for shelter -- in which direction to rush, while cars turned about in confusion, clogging the streets, and drivers rolled down their car windows in anticipation of glass exploding inside the vehicle from the concussive force of a blast. And in four minutes the car did explode with a plume of black smoke wending toward the sky. Seven people were killed, over a dozen more injured. This was only one of a dozen explosions within the space of an hour that overtook the country on Wednesday morning. 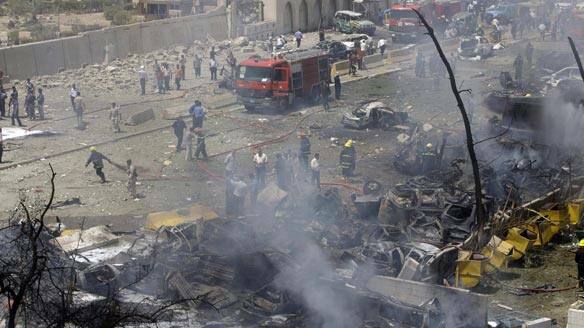 In total several days ago the bombs that struck in mostly Shiite areas killed 74 people. Before that day, in the days previous, ghastly scenes of beheaded bodies were being discovered. That same Wednesday morning jihadists entered the home of a Shiite family in the Sunni-majority town of Latifiya and slaughtered seven people. Four children and three adults. All the members of that family had been decapitated. Security forces have embarked on operations dubbed "the revenge of the martyrs" in Sunni neighbourhoods. Hundreds of Sunni 'extremists' have been arrested; the government claims a bomb-making factory was discovered. The rift between Sunni and Shiite Iraqis is marked and steadily widening; while Shia government moves have antagonized the Sunni community, they have barely effected the level of violence erupting through the country. Al-Qaeda's Internet videos of executions they carry out within Iraq have inspired fear and foreboding throughout the country. The 'martyrs' on each side of the equation are set to exact their revenge. Iraqis now fear that within their own country -- exclusive of the Kurdish autonomous region -- there is no safety to be found; not in the markets, their restaurants, the neighbourhood sport fields; even children's soccer games are vulnerable to becoming targets for the jihadists. And with the ongoing conflict in Syria, the further influx of refugees from that war-torn country where the atrocities are accelerating, it appears more and more likely that Iraq too will be swept into a cyclone of terror and vengeance killings. The spreading malignancy of Islamism and its jihadist mentality of hatred and annihilation. John Kerry: "We know rockets came only from regime-controlled areas"
US Secretary of State John Kerry has said Syrian government forces killed 1,429 people in a chemical weapons attack near Damascus last week. 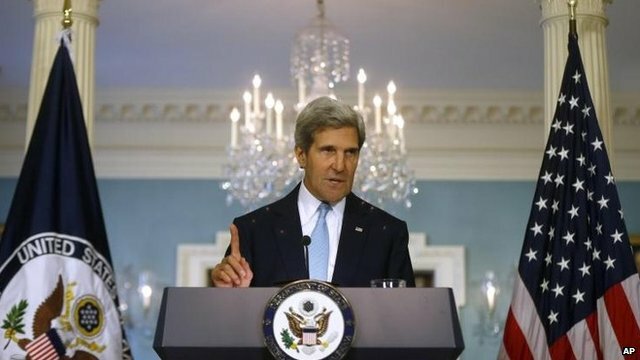 Mr Kerry said the dead included 426 children, and described the attack as an "inconceivable horror". Shortly afterwards, President Barack Obama said the Syrian chemical attack threatened US national security interests. He said the US was considering a "limited narrow act". The government of President Bashar al-Assad has denied carrying out last week's attack and blames rebel forces. UN chemical weapons inspectors are investigating the alleged poison-gas attacks and will present preliminary findings to the UN after they leave Damascus on Saturday. But Mr Kerry said the US already had the facts, and nothing that the UN weapons inspectors found could tell the world anything new. He said that any response would not involve the US in a protracted conflict like Iraq or Afghanistan. The US government earlier published an assessment of its intelligence, saying this information was backed by accounts from medical personnel, witnesses and journalists, videos and thousands of social media reports. He said the evidence showed 1,429 people had been killed and that regime forces had prepared for the attack three days earlier. "We know rockets came only from regime-controlled areas and landed only in opposition-held areas," he said. "All of these things we know, the American intelligence community has high confidence." Mr Kerry called Mr Assad "a thug and a murderer" but said any response by the US would be carefully measured to avoid open-ended commitments. There is no doubt that a chemical weapons attack took place but not such a compelling case on who did it. The evidence tying this attack directly to the Assad regime was largely circumstantial and asserted - not revealed. What we would like are the details of the conversations, who carried them out and the background. This is one of the conundrums of intelligence - the reluctance of the people who collect it to reveal in detail what they collected because of the fear of loss of sources and methods. Another key element missing is why is this important to US national security and important enough where we would consider a military attack because doubts persist in the US about why we should do this. About 100,000 died before from conventional munitions and we did nothing. And Kerry did not in the same compelling fashion that he laid the chemical attack at the regime's feet explain why he was certain that a US military attack would bring the Syrian regime to the negotiating table. The US was also dealt a blow on Thursday when the UK parliament rejected a motion supporting the principle of military intervention. The vote rules the UK out of any potential military alliance. However, US officials said they would continue to push for a coalition, and France said it was ready to take action in Syria alongside the US. President Francois Hollande said the UK vote made no difference to France's position. "Each country is sovereign to participate or not in an operation. That is as valid for Britain as it is for France," he said. He said that if the UN Security Council was unable to act, a coalition would form including the Arab League and European countries. "France will be part of it. France is ready," he said. He ruled out strikes while the UN inspectors were in Syria. However he did not rule out the possibility that military action could be taken before next Wednesday, when the French parliament is due to debate the issue. Neither France nor the US need parliamentary approval for action. The use of chemical weapons is banned under several treaties, and is also considered illegal under customary international humanitarian law. The Syrian army is known to have stockpiles of chemical agents including sarin gas. Earlier accounts of the attack in Damascus quoted officials from medical charity Medicins Sans Frontieres as saying 355 people had been killed. Opposition sources later claimed more than 1,000 people had died. The UN inspectors have collected various samples that will now be examined in laboratories across the world. The UN team is not mandated to apportion blame for the attacks. In another development on Friday, Turkish Prime Minister Recep Tayyip Erdogan - a vocal opponent of the Syrian government - said limited intervention in Syria "wouldn't be satisfactory". Speaking at a reception in Ankara, he said any action should be more like the international intervention over Kosovo in 1999. Despite the lack of a UN resolution, the US and UK supported more than 70 days of air strikes against the Federal Republic of Yugoslavia to protect civilians from further attacks in Kosovo. The Obama administration is reportedly studying the Nato-led military campaign as a potential precedent for intervention without a specific UN mandate. Shocking video emerges after an apparent fire-bomb attack leaves students with injuries that may have been caused by Napalm. People suffering from Napalm-like burns have been speaking of an attack in which a plane apparently dropped an incendiary bomb on students in Syria. Video said to be from the town of Urum al Kubra, close to Aleppo, shows a man reported to be a school teacher, who says the students were attacked as they tried to escape from an attack nearby. "The plane hit a residential area in Urum al Kubra," he explains. "We tried to get out quickly so we don't get hurt, but it seems someone's fate caught up with them today. "A gathering of students formed, which is normal as the students needed to leave under these circumstances, and the plane hit us." The video, posted on the internet, is said to have come from an account associated with a rebel group in Aleppo. In another video filmed in the aftermath of the attack, a doctor reports seven deaths and 50 injuries - and says the burns resembled Napalm injuries. However, the use of the substance has not been confirmed. A BBC television crew who witnessed the bombing reported no shrapnel injuries and said the victims resembled "the walking dead". Napalm is not classified as an outlawed chemical weapon although it can cause devastating burn injuries. Infamously used in the Vietnam War - as well as the Second World War - the jelly-like substance sticks to skin and burns at very high temperatures. A United Nations convention prohibits using incendiary weapons against civilians, or against military targets located near civilian populations. The pictures of the school attack emerged after MPs voted against military action over alleged chemical weapons gas attacks by the Syrian regime. Some have described the outcome as a "humiliation" for the government and means the US may have to go ahead alone with any military strikes. Speaking to Sky News, former Liberal Democrat leader Paddy Ashdown said the vote had left him "ashamed" and said it was vital to act to stop attacks on innocent civilians. "In more than 50 years of trying to serve my country in one form or another, I don't think I have ever felt more depressed this morning or more ashamed. "I now am condemned to watch those children burn in that schoolhouse yesterday and be a country that shrugs its shoulders and says 'nothing to do with me'." The shock Thursday, Aug. 29, of Britain’s David Cameron parliamentary defeat – thereby knocking America’s foremost partner out of the coming strike against Syria – highlighted public opposition to the operation in America and criticism in the top US military command. The White House hastened to stress that America, while still interested in engaging allies, was ready to act unilaterally without UN or allied support. Nonetheless, the Syrian conflict after nearly three years continues to be covered in confusion, much of it generated by the Obama administration’s conflicting policies. After resolute condemnation of the Assad regime’s “heinous crime” of using chemical weapons against its people, the president opted for a low-key, practically painless military strike against Syria. The Syria ruler would be able to wave his hands in a gesture of victory, followed by Vladmir Putin. Iran’s leader Ayatollah Ali Khamenei would say, I told you so, the United States is a paper tiger and will never attack our nuclear program. 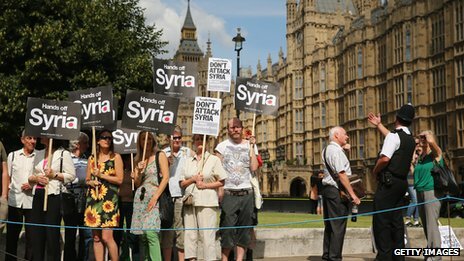 By voting for opposition Labor’s motion against UK involvement in military action in Syria, the British parliament not only shattered Obama’s multinational coalition for Syria; it struck at the heart of the North Atlantic Treaty Alliance (NATO), the historic bulwark of Western security since the last world war. The alliance’s fortunes have faded progressively under the vacillating foreign and security polices of President Barack Obama. In 2009, the US president announced a new policy direction that would henceforth hinge on a “tilt to the East.” It was followed by America’s untidy military exit from Iraq and fumbles in Afghanistan leaving both countries prey to the havoc of bloody sectarian warfare. His refusal to acknowledge the menacing spread of al Qaeda was compounded by his muddled approach to the Arab Revolt : While endorsing the overthrow of two autocrats, Mubarak and Qadafi, he conducted a hands-off policy for the most bloodthirsty tyrant of the Arab world, Bashar Assad, and Iran’s hired terrorist chief, Hassan Nasrallah. In the Middle East, Obama insisted that the US and the West stay out of the region’s affairs. While advising its leaders, including Israel’s, not to depend on America, he demanded their obedience at the same time. In the Syrian crisis, Obama is reaping the harvest of his inconsistent foreign policies, which can no longer be papered over with fine speeches. The fall of Egypt’s Muslim Brotherhood, which he championed as the epitome of Islamic moderation, shattered US influence in the region and placed it at a hazardous crossroads, while his tepid military plans for Bashar Assad have resulted in the sounding NATO’s death knell. The half-hearted military operation against Syria, due to be launched in the coming days, and its muddled objectives, may finally close the book on the current chapter of US history in the Middle East – even if it successful. The world will be left rubbing its eyes in amazement at the achievement of one individual, president Barack Obama of the USA, in smashing American influence in this sensitive region and Europe in the space of a few short years. British Prime Minister David Cameron’s political future is in grave doubt after the House of Commons withheld endorsement from the government’s policy of participation in a US-led strike on Syria. Parliament voted 285 in favor to 272 against, with 30 members of his own Conservative party and 9 of his coalition partner, the Liberals, crossing the line and voting with the Labor opposition against the government. Cameron may be just the first victim among Western and Middle East leaders who opted to toe Obama’s wavering line and continually shift around their national interests. Israeli Prime Minister Binyamin Netanyahu is fond of saying his policies are “responsible and balanced.” This mostly translates into inaction or procrastination on such vital issues as Iran’s nuclear aspirations and Hizballah’s massive buildup of rockets. But now, Khamenei, Assad and Nasrallah will be buoyed up by America’s loss of allied support and more likely than not make good on their threats, heard repeatedly in the past week, to destroy Israel once and for all. It won’t be enough to keep on intoning solemnly that Israel is not involved in the Syrian conflict – which no one believes anyway. Netanyahu will have to start looking squarely at the perils just around the corner and move proactively. "We were talking about Hezbollah, Hezbollah has social military, political, different branches within Hezbollah We were talking about the military branch. You know, The Resistance." "Our numbers are increasing day after day, and we are getting better and our training is becoming better and we are becoming more confident in our future and more armed. And if someone is betting that our weapons are rusting, we tell them that every weapon that rusts is replaced." "We will never let go of our arms. We consider our arms like blood flowing in our veins." 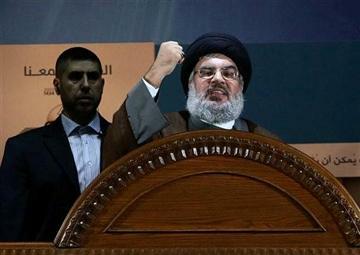 2, 2013, file photo, Hezbollah leader Sheik Hassan Nasrallah speaks during a rally to mark Jerusalem day or Al-Quds day, in the southern suburb of Beirut, Lebanon. Hezbollah, the Party of God terrorist group that holds Lebanon in thrall within its malign, very well weaponized presence, has a significant presence elsewhere. Actually almost anywhere; Europe, North America, Australia and specifically Canada. When Mohammad Hussein al Husseini was arrested in Canada and interviewed by Canadian security officials he supplied very interesting information on Hezbollah's violence abroad and on their activities within Canada. "Hezbollah", he assured his questioners before he was deported, "has members in Montreal, Ottawa, Toronto - in all of Canada." He was capable of providing Canadian authorities with information relating to the cigarette and weapons smuggling benefiting Hezbollah through its criminal activities meant to further the advances of Hezbollah in the Middle East and elsewhere if the Canadian authorities were interested in a trade; information for a deal. What was revealed was names, of those who operated the Canadian part of Hezbollah's funding and procurement network. Materials were sought and procured for Hezbollah. They indulged in credit card and bank fraud to partially cover the cost of items procured for Hezbollah. The network purchased battlefield items and smuggled them into Lebanon. Commander James Campbell, formerly with U.S. Defence Intelligence Agency, a counterterrorism intelligence officer, cited night-vision devices (goggles, cameras and scopes), surveying equipment, global positioning systems (watches and aviation antennae), mine and metal detection equipment, camera and video equipment, advanced aircraft analysis and design software and computer equipment. An extensive shopping list of vital must-have items to ensure that the terrorist group didn't run short of useful tools pursuing assassination attempts in the larger international community, or guerrilla-type activities closer to home. Wherever, in fact, their major sponsor the Islamic Republic of Iran ordered them to focus their attention. Since Hezbollah's 2006 war with Israel, the procurement program had a certain urgency; to replenish its weapons stocks. Missiles were provided by Iran and Syria. Small arms and ammunition and shoulder-fired rockets and dual-use items procured through Hezbollah procurement networks. Raising funds through criminal activities in Europe and North America and expending those funds in aid of advancing the program of Shia Islamism prepared to assert itself as the truly meaningful Islamist power usurping the conceits of Sunni Islamists. Hezbollah agent Mohammad Dbouk indicted in U.S. federal court under Operation Smokescreen was trained by Iran as "an intelligence specialist and propagandist [who] was dispatched to Canada by Hezbollah for the express purpose of obtaining surveillance equipment", according to information collected by the Canadian Security Intelligence Service. Located first in Montreal and then Vancouver, later in Detroit. A treasured member of Hezbollah, who, wishing to dedicate himself as a blessed martyr to the cause was instructed instead to continue his invaluable procurement and propaganda work. Now sadly incarcerated in an American prison where he was quoted as having said: "...he did not care about anything and was committed to securing all the items for the brothers at any cost; he was attempting to avoid going to hell and secure a place in heaven by so doing." Granting such a sincere desire shouldn't really be all that difficult... But then western justice doesn't lend itself to capital punishment outside trial and jury judgement, alas. "Do not be fooled. He is not giving his life. We are taking his life. This is not his gift to God. This is his debt to society. He is a criminal. He is a cold-blooded murderer." The military jury comprised of army combat veterans and senior U.S. officers deliberated just over two hours to come to their agreement that Maj. Nidal Hasan merited the death penalty for his gruesome attack in Fort Hood, Texas in 2009 on fellow soldiers. They unarmed, appearing at the military station where they would be receiving their last shots and orders before embarking on their mission to Afghanistan, and he, determined to lethally detain them, very well armed. He was sentenced to death by lethal injection for the murder of thirteen soldiers on November 5, 2009. He was found guilty of 45 counts of murder and attempted murder in the Islamist rampage where he lived out his fantasy of murderous jihad. Wearing green fatigues and carrying a laser-sighted semi-automatic pistol that he had practised his proficiency with leading up the atrocity, he fired 146 rounds at men and women desperate to escape the mayhem. He and he alone decided that 42 years of age would be the right time to present himself as a martyr. His martyrdom could have been achieved four years earlier, had he been shot to death, as he preferred. Even yet, though, he may not achieve his dream of personal sacrifice to honour Islam. The American military justice system errs on the side of humanity and justice, requiring an appeal process. He may yet wait years to achieve the status he yearns for. As for the families and friends of his victims and those whose lives he altered forever through vicious injury done them, their wish to see him dead will simply be set temporarily aside. They may perhaps take comfort in the fact that his own wishes have been foiled. He has no wish to remain imprisoned, his health and welfare as a quadriplegic murderer the focus of a system beyond his control. His defence was his intense desire to protect the Afghan Taliban from assaults that could be mounted against them by the forces of the country he was himself born into. Where he was raised, educated, trained and became a part of the society. He was not forcibly inducted into the military; he joined it of his own volition and was exposed to the profession he would make his own as a U.S. army psychiatrist. That old adage of a physician needing to paid heed to the requirement to heal himself before setting out to heal others surely stemmed from some other, previous, perhaps ancient event of similar disturbing cataclysmic effect that the human mind is so capable of succumbing to, and in the process inflicting horrendous pain upon others. "The defence rests" complacently, awaiting salvation. In the face of statements by senior US officials that the Obama administration had crossed the Rubicon on military intervention in Syria, President Barack Obama declared early Thursday, Aug. 29, that he had not yet made a decision on whether to order a military strike against Syria. Although Defense Secretary Chuck Hagel announced that US armed forces were “ready to go,” Obama said he was still examining options with his security team. At the same time, the White House suddenly appeared Wednesday night to be engaging in maneuvers for buying time and holding up military action against Syria, after the armies of the Middle East and half of Europe were already standing ready after completing massive war preparations. Another were grumbles from the president’s circle that President Obama had found himself jammed in an awkward timeline generated by his foreign travel schedule – he is due to take off next Wednesday, Sept. 4, for Sweden on his way to the G-20 summit in St. Petersburg of Sep. 5-6. This left the optimal dates for his decision to go through with the attack as Friday night, early Saturday, Aug. 31 or after Labor Day, which falls on Sept. 2. Although Obama appeared still to be standing by that decision, debkafile’s Washington and Moscow sources disclose he has applied the brakes on the momentum for its implemention to buy time for US Secretary of State John Kerry to wind up secret negotiations with Russian Foreign Minister Sergey Lavrov and strike a deal: The US would soften its military action against the Assad regime and his army and reduce it to a token blow, after which the American and Russian presidents would announce the convening of Geneva-2 to hammer out a solution of the Syrian crisis and end the civil war. The Kerry-Lavrov back channel has not yet achieved results and so, Thursday, the fate of the US strike on Syria was still highly fluid and its timeline changeable. The BBC's Jeremy Bowen in Damascus: "People are going about their daily business but there is a lot of anxiety"
Syrian President Bashar al-Assad has said his country will defend itself against Western aggression, as the UK and US seek support for intervention. The five permanent Security Council members met for less than an hour and left without commenting. The US and UK say the Assad regime killed hundreds in recent poison gas attacks. Damascus denies the claims and blames the attacks on rebels. UN chemical weapons experts are in Syria investigating the attacks. 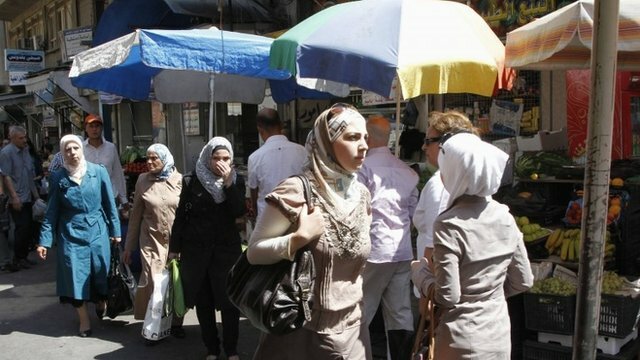 Anxiety may be haunting the population of Damascus, but there is no sign of panic as they go about their daily routines. Government offices are operating as normal in their normal locations. Nor can one see any impact from the crisis on the availability of food. There is plenty of flour and the ministry of supply says that there are sufficient reserves of it. In the early days of the crisis, some people started to stockpile food, but when in the following days they realised there was enough they stopped stockpiling, especially because of the high prices. With all the tourists gone from Damascus, the only inhabitants of the hotels are either journalists or people working for international organisations. In Hamadiyeh market, merchants without customers to serve sit around watching TV to follow the latest developments. Samples taken during their site visits will be tested in various European laboratories. It is unclear when the inspectors' final report will be released. The UN has said the tests will take "longer than days". Their mandate does not involve apportioning blame for the attacks, which took place in eastern Damascus on 21 August and left at least 355 dead. The UK pushed for a UN Security Council resolution facilitating the use of force on Wednesday, but no agreement was reached. The five permanent members - Russia, France, China, the UK and US - reconvened at 18:30 GMT on Thursday but ended the meeting less than an hour later. Russia, which has twice blocked resolutions condemning Mr Assad, called the meeting. Analysts say Moscow is unlikely to agree to any resolution approving the use of force in Syria. Russia has close ties with the Assad government, supplying its armed forces with weapons and housing its warships in Syria's ports. Earlier, German Chancellor Angela Merkel spoke to Russian President Vladimir Putin over the phone to urge Russia to help the Security Council frame a "quick, unanimous international reaction". However, the British prime minister's office said in a statement that the UK could still take "exceptional measures including targeted military intervention" on humanitarian grounds, even if the Security Council could not agree. British MPs will vote later on a motion that backs the principle of military intervention and says "a UN process must be followed as far as possible". US officials are expected to brief senior Congress politicians later on the evidence against Mr Assad's government. White House spokesman Josh Earnest strongly denied comparisons between potential US action in Syria, and the 2003 invasion of Iraq. "What we saw in [Iraq] was an administration that was searching high and low to produce evidence to justify a military invasion," he said. "What we have seen here tragically is a preponderance of evidence available in the public domain that the Assad regime used chemical weapons against innocent civilians." He insisted that the US was not contemplating "regime change" in Syria, and any intervention would be "very discrete and limited". Mr Assad told a group of Yemeni MPs that Syria would defend itself against any aggression, according to Syria's Sana news agency. "Syria, with its steadfast people and brave army, will continue eliminating terrorism, which is utilised by Israel and Western countries to serve their interests in fragmenting the region," he said. In Damascus, senior military commanders are reportedly staying away from buildings thought likely to be targeted. Many Damascus residents have fled the city in fear of an impending attack. Long lines of cars loaded with suitcases have been waiting at the main Masnaa border crossing into Lebanon. But state television is portraying citizens going about their normal lives, seemingly unperturbed by the prospect of military strikes. "They're trying to get the outline of a coalition. You have to make sure everything is well co-ordinated from the top down. Bringing the CDS over is tremendously powerful symbolism for any military and diplomatic encounters. It's a symbol we're serious about this." Canada's Chief of the Defence Staff Gen.Tom Lawson met with Gen. Martin Dempsey, chairman of the U.S. Joint Chiefs of Staff in Jordan, along with military leaders representing eight other nations. It was a three-day meeting involving top generals from the United States, Canada, Jordan, Saudi Arabia, Qatar, Turkey, the United Kingdom, France, Germany and Italy. Thus far, only Germany and Italy have expressed reservations about military strikes in Syria. The United States and 188 other nations of the world are joint signatories to a chemical weapons convention that opposes the use of such weapons of mass destruction. Because they are in a position of being outlawed for use by most civil countries of the world, their blatant use represents a violation of what is considered to be norms in the use of conventional weapons. A fine distinction that could very well be lost on those slaughtered by any conventional military. The simple fact being that through the use of conventional military weaponry, rockets, artillery, the regime's military has engaged in mass slaughter in the deaths of countless of its civilians, men, women, the elderly, children. Over a hundred thousand people is the figure put out by the United Nations. Thousands of more wounded. Millions homeless, as internal or external refugees. With those numbers those who died through the use of poisonous gases represent a relatively small figure. It is the grotesquely gruesome spectacle of people dying painfully when their nervous system has been deranged through the effects of a deadly gas with horrifying effect. Violent death through any mode of delivery is horrifying, but the spectacle of vulnerable young children suddenly suffocated in their sleep, of children suffering the dreadful effects of sarin, or people helpless in the miserable throes of approaching death that strikes us so powerfully. When conventions have been universally accepted and signed, even though Syria was never a signatory to this one, the offence against humanity represented by the use of such lethal chemicals on innocent people, and most particularly helpless children, is enraging. "The Prime Minister made it clear that he shares the view that the recent chemical weapons attack was carried out by the Syrian regime and described the use of these weapons as an outrage", went a statement by Prime Minister Harper's office. The Canadian Prime Minister and the American president have instructed their officials to "remain closely in touch in the days ahead". Russian Ambassador to Canada, Georgiy Mamedov, at a luncheon in Ottawa to discuss the G20 summit to take place in St.Petersburg next week, unburdened himself of his country's position on the matter. "Stay out of any military adventure and help two sides to get together at the conference table." And how would Russia respond if the West does proceed to intervene militarily? "The regular way. We will say that it's a terrible mistake, like we did during Iraq." And there's an intriguing and ironic turnabout in how we generally view such matters. 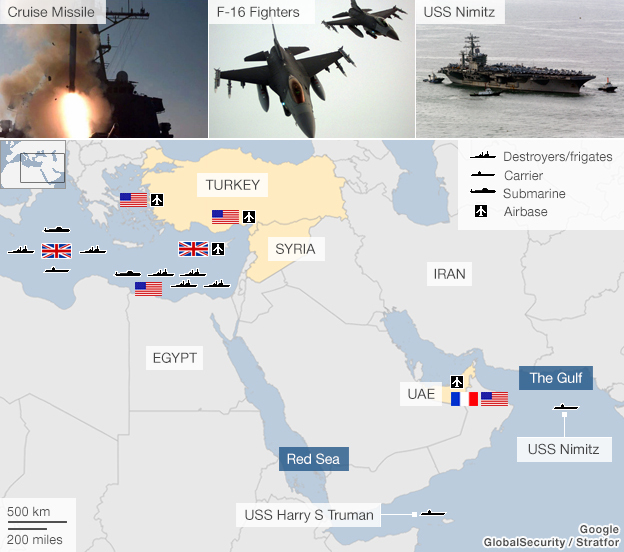 The Western, democratic, liberal and war-avoiding countries are set to launch air strikes from offshore against Syrian military targets to deliver a message of punishment for having ignored pleas to make an end to the war against its civilian population. And the two countries whose evident disregard for the niceties of human rights and who have committed war crimes against their neighbours now caution against military means in Syria. According to NBC News, missile strikes could be launched "as early as Thursday", against Syria. The United States is contemplating "three days" of strikes limited in scope whose purpose is to deliver a strong message, rather than concentrate and plan to weaken the regime's military capabilities. It is in the national security interest of the U.S. to ensure the use of chemical weapons "not go unanswered". And so, it appears, it will not. "Don't be fooled by these lies and deception that aim to label us with terrorism, violence, (and) killing ... at a time when the hands of the coup regime are drowned in blood." Even as Mohammed el-Beltagy, seeking refuge from capture by the Egyptian military denies accusations the Muslim Brotherhood is committing "terrorism" in the wake of the coup that removed Mohammed Morsi from the presidency, there are new demonstrations in the planning stages. The last demonstration that had been planned and labelled "the Day of Martyrdom" hadn't been successful in persuading large numbers of Brotherhood supporters out on the streets. It was a lame, limpid, phlegmatic affair, soon dispersed after having accomplished nothing much. The new demonstrations are meant to present defiance of the security crackdown that has emasculated the effectiveness of the Brotherhood movement by imprisoning most of its senior and mid-level leadership. Among whom now is 25-year-old Mohamed Soltan, son of Brotherhood figure Salah Soltan. His arrest certain to bring the attention of the U.S. through his American citizenship. There remains polarized opinion within the U.S. government over the situation in Egypt. The U.S. had seen fit to surrender their long-time ally, former president Hosni Mubarak to his fate, to limply endorse the Muslim Brotherhood and Mohammed Morsi who had lived and studied in the U.S. Perhaps the current interim government in Egypt and the military are giving the U.S. a little pay-back in their resistance to armed intervention in Syria, now. El-Beltagy is wanted on accusations of inciting violence. The former lawmaker has evaded capture for three weeks. In a videotaped message aired on Al-Jazeera Mr. el-Beltagy insists Egyptian authorities were busy turning a "political crisis" into a security problem with their accusations of terrorism on the part of the Brotherhood. There certainly seemed an illusion of terrorism after the military break-up of the two Brotherhood sit-ins at opposite ends of Cairo, with its unfortunate death rate, when Morsi supporters went on a violent rampage, attacking police stations, government buildings and Christian churches. Charges of inciting to violence were levelled against Brotherhood leaders and they were taken into custody to face those charges in a court of law. 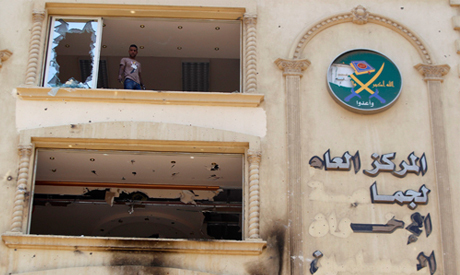 Egypt's interior ministry released figures claiming that 106 security personnel were killed since August 14. Over 900 were wounded in violence. That number including soldiers and police. Police claim the Brotherhood remained committed to spreading chaos and violence in the country through inciting splits among army ranks and police. Along with acts of civil disobedience. While some Egyptian authorities are in favour of outlawing the Muslim Brotherhood, others aren't quite so willing to do so. The Brotherhood is well known to have made alliances with al-Qaeda, Hamas and Islamic Jihad (both knock-offs) in the Sinai, conducting an onslaught there against Egyptian security with the help of local Bedouin Islamists. Past attempts at mediation with the Brotherhood had failed. "Let's face it, there were some serious attempts [at mediation] before the 30 June demonstrations and before the 3 July [removal of Morsi] but they did not work", one political source involved in discussions with state bodies and Brotherhood leaders said. "From what I know, the army, [especially Defence Minister and Army Chief Abdel-Fattah El-Sisi] was hoping the mediation [before Morsi's removal] would work", he said. In fact, El-Sisi had given Morsi more than adequate advance warning. That mediation at that time was for a mutually-agreed upon pact to suspend demonstrations in return for the president's agreement on holding a referendum to determine popular opinion whether he should complete his four-year term. Those mediation efforts had been supported by some European foreign ministers and Cairo-based ambassadors, but they failed. "Because the Brotherhood leaders and president Morsi himself did not believe there would be big demonstrations." New negotiations are being considered between government and the Brotherhood which would address an end to both anti-state and anti-Islamist incitement, along with the release of all Brotherhood members under arrest proven innocent of inciting or committing acts of violence and inclusive of the suspension of anti-military attacks in Sinai. The government would then be prepared to reconsider its previous stance on the dissolution of the Brotherhood. Fair enough...?